So far I have been using the avalanche method to pay down my debts and it has been working out pretty well for me so far. It has helped me minimize the amount of interest that I am paying over the life of my student loans, and it has definitely been the most practical way to do things up until this point. With four of my private loans having interest rates of over 7% and my government loans ranging from 3-6%, this was the best way to do this. Looking forward at my 2014 loan goals and repayment periods I have started to re-assess my payment strategy with some other goals in mind.The other main goal that I’m talking about is finally being able to move out. I’m super grateful that my parents have allowed me to live at home for only $100 a month, but I’d like to have that feeling of independence again. Unfortunately with the cost of renting in my area being around $900-1000 a month for a 1-bedroom and the amount I have to put towards minimum payments, that would put me really close to maxing out my budget every month and slowing down my student loan repayment tremendously. But now I feel after playing around with unbury.me a bit, I have some room and other options that may provide for a quicker opportunity to move out. Based on current monthly minimums I am forced to pay at least $800 a month for all my student loans. I’m thinking that it will cost me around $1600 a month to live by myself, so with the $800 loans that doesn’t leave me much wiggle room for savings for things I want to do vs. regular savings, and there would definitely have to be some sacrifices made to have one or the other. Initially looking over my loans, there were some big savings in going with avalanche method of debt repayment versus the snowball method. Now that I’m further into my repayment and have taken the majority of the interest in the first year of repayment, as well as paying off two of my private student loans, the difference becomes less drastic. Now the difference between the two payments is “only” $500, and while that is nothing to scoff at if it can help me move out by next year, $500 seems like a small price to pay for that freedom. I’ll obviously have to factor in the initial costs of moving out, getting furniture, and anything else that I might be forgetting right now but I’m really starting to think that it’s manageable and even a realistic goal for mid-2015 at this point. Things like this get me excited and make me happy that I started blogging and making my debt payoff my #1 priority! Though after doing some more math, I determined it wasn’t as simple as deciding between a snowball method and a straight avalanche payback. My best bet actually seems like paying off Private Loan #1 first, and then starting to pay off my government loans by their highest interest with Private Loan #2 being the last loan that gets paid off. I would then drop my monthly payments down once the move out occurs, which would incur me another $1000 extra in interest. So i’d pay an extra $1500 over the life of my loans combined, but I still think that it is worth it! Paying off Private Loan #1 will drop my minimum monthly payments by $272, which is by far the highest minimum I have to pay. I’ve worked it out that I could knock off enough minimum payments from the government loans to be down around $400 a month by March-April 2015 which sounds much more manageable than the $800 minimum I’m paying now. Plus, moving out now would cause a much bigger increase than the $1500 extra in loan interest I would pay from waiting until then. And at that point, there would still be 3 government loans left to pay off as well as Private Loan #2. 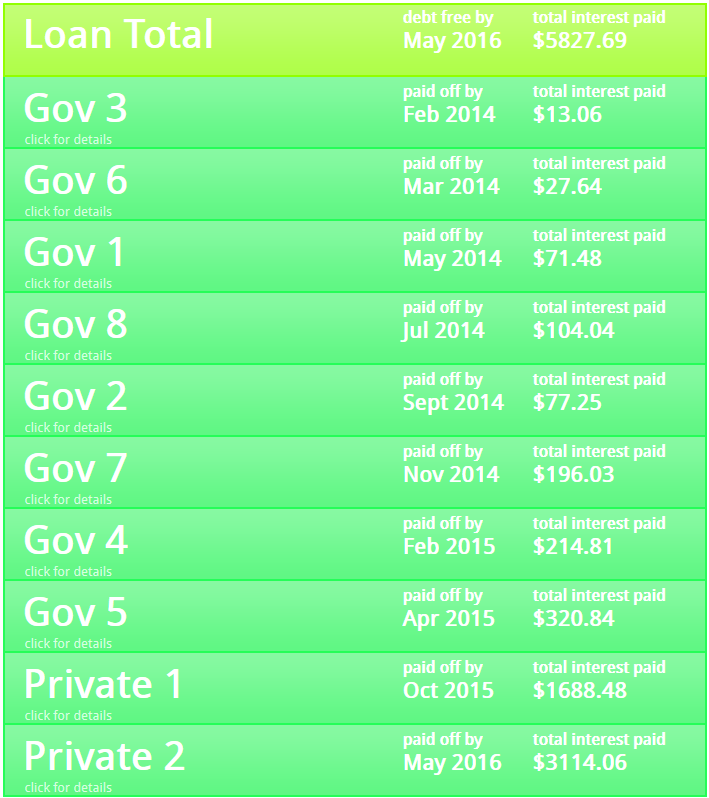 Those government loans would drop off quickly, and would most likely be paid off by the end of 2015 even at reduced pace of paying $800-$1000 a month instead of the $2300 I am currently paying each month. The only loan I would be left would be Private Loan #2 with a minimum payment of only $195 a month. Suddenly things are looking much better compared to doing a straight avalanche and waiting forever with my two huge private loans! For now, nothing will change with my strategy. 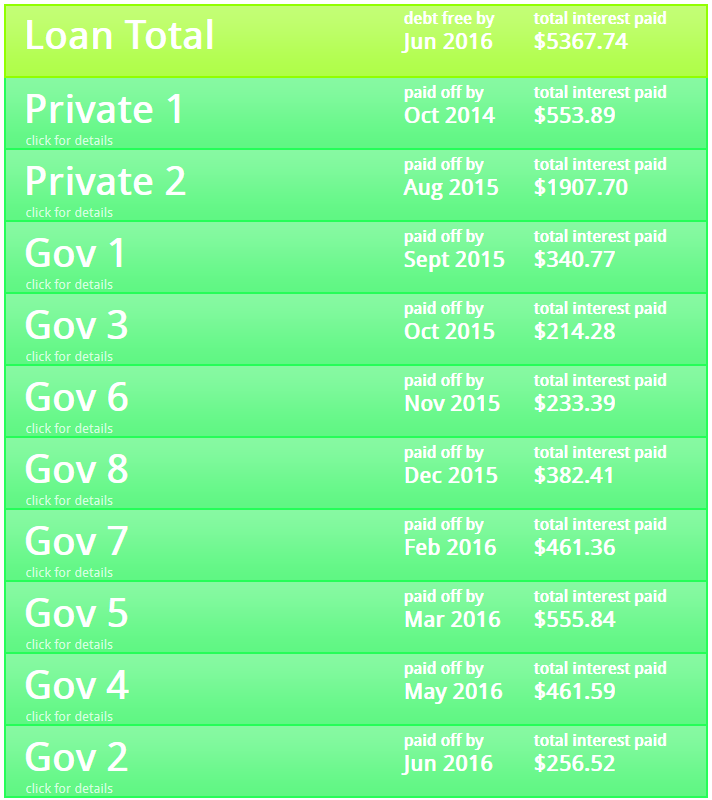 I will keep paying off Private Loan #1 as fast as possible and making payments of $2300 each month as part of my main strategy. When I finally pay that off later in the year and it comes to time to make a decision on what to do next, I will strongly consider using my “hybrid” style of paying back my loans instead of going straight to Private Loan #2. What do you think I should do? Stick with the avalanche method to minimize the amount I pay over the life of the loans? Or go with my second approach to sacrifice around ~$1500 extra in order to move out sooner?